What should you do first when starting to implement lean manufacturing? What comes next, then next? With the raft of information now available about lean principles, it’s easy to get confused. Kaizen Express clarifies the process using a rapid, nonstop style to explain the essential elements of the Toyota Production System (TPS) in a logical implementation sequence. This succinct but comprehensive back-to-basics book offers lean novices and veterans alike a comprehensive primer on lean principles and implementation that returns to fundamentals and stresses the importance of learning by doing at the individual and team levels. “It’s easy to forget the fundamentals while pursuing advanced methods,” writes Jim Womack, LEI founder and chairman, in the Foreword. 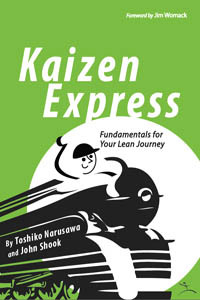 “I constantly encounter firms focusing on high-level issues of lean management, strategy, and corporate culture that have completely ignored creating a solid foundation at the level where the real work is done.” Originally developed as an aid for teaching the essential elements of TPS to Japanese readers and non-Japanese readers working together at Japanese factories around the world, Kaizen Express keeps the bilingual format. It also preserves the illustrations or charts on every page that reinforce key points. The book also includes a glossary of TPS terms in English and Japanese and a set of standard forms used to implement TPS at production sites.